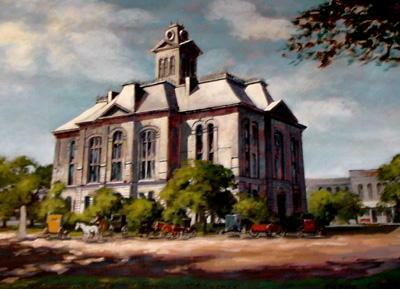 The 1888 Austin county courthouse Bellville Texas. 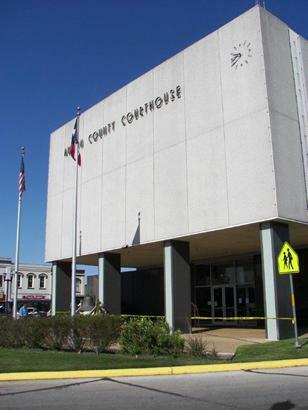 Note: Austin County has had a total of six courthouses according to the Bellville Times. 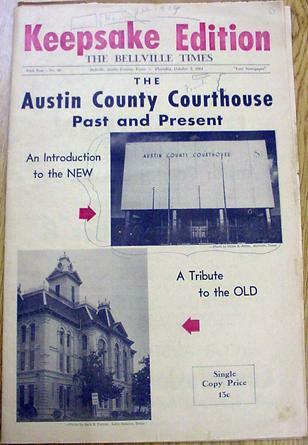 Courthouses of Texas by Mavis P. Kelsey, Sr. and Donald H. Dyal list only four. Both sources agree on the final two - (1888 and 1960) which are the ones discussed in this article. Our article here contains some mention of the old, some mention of the new, some mention of the fire, and some mention of people's reaction. But the one subject that outweighs all the others combined is the widespread remembrance of the former courthouse. Reminders are found all over town. 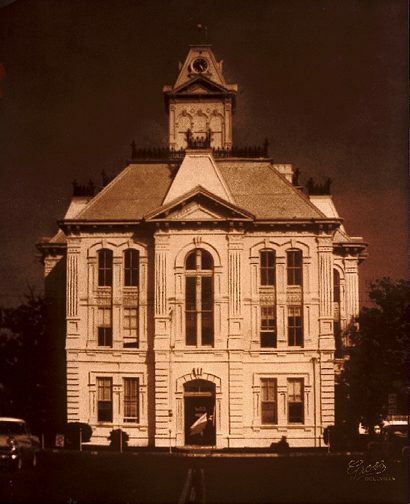 The 1888 Courthouse designed by Eugene T. Heiner was built for a total cost of $45,000. 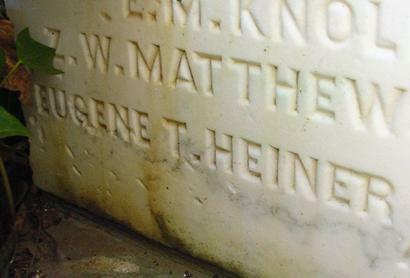 Heiner's commission was $955.50. (Architects usually received a percentage of the total cost.) A prolific designer based in Houston, Heiner had designed scores of buildings, including many courthouses (See The Courthouses of Eugene Heiner.) 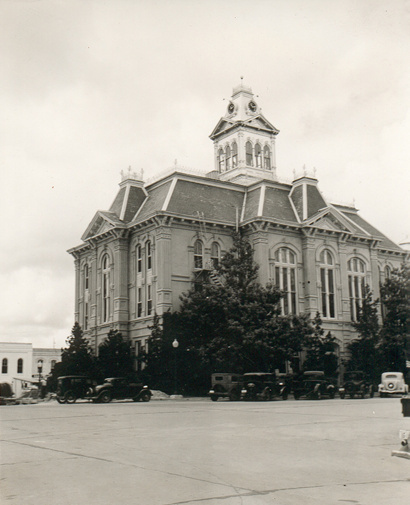 Today only Lavaca County (Hallettsville) and Wharton County (Wharton) have unaltered Heiner courthouses. After the 1960 fire, the cornerstone of the 1888 courthouse took several taps from the wrecking ball to dislodge it. Once loosened, a crowd searched the stone for the articles that had been placed in it when it was set. Unfortunately most of the contents had been ruined by dampness and rot. A few Czech language newspapers (printed in Texas) crumbled into dust before they could read. It also contained a A Bible that was recognizable only by its covers. The frugality of a previous generation of Bellvillains was shown when only two coins were found (both dated 1876). There was also Civil War paper script for 50 cents. The town druggist had left a small box of pills and a square-headed nail from the previous courthouse was also included. To avoid a similar disappointment for those who will eventually open the last capsule, special precautions were taken. The new "capsule" is actually a bronze box which was soldered shut to repel dampness. But since the public had been invited to contribute things, a tardy donor caused the box to be pried open to accept the late item. The present building doesn't have a cornerstone due to the slab-type style of construction. Instead, the box was hidden behind a corner slab. The 1876 coins were replaced along with five more coins; a quarter (said to represent the county judge) and four nickels to represent the county commissioners. Probably inspired by the old druggist's offering, a Bellville doctor placed a box of Anacin in the new capsule. A Humble Credit Card was contributed - and not to be outdone, the local Texaco dealer contributed "a Texas Company" credit card. The reason for building the new courthouse was a fire of undetermined origin. 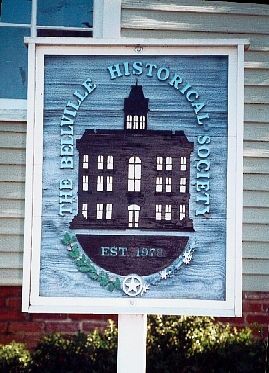 About 2:30 a.m. on April 5, 1960, Bellville's night watchman heard breaking glass. It is thought that the heat from the already-burning fire was shattering the windows. After phoning for help, he returned to see flames already approaching the tower. Within five minutes, fire departments from Sealy, New Ulm, Industry and Rosenburg were responding. (Brenham was not mentioned.) One fireman reported that he had traveled 42 miles in 28 minutes (which works out to be 90 miles per hour). Before long the bell crashed through the building's roof and went all the way to the basement. It was estimated that 450,000 gallons of water were sprayed onto the building and others on the square that were in danger of being ignited by cinders. When it was all over, the cracked bell in the basement was under four feet of water. Casper Balke, a resident of Bleiblerville (11 air miles from Bellville) reported seeing the flames from that distance. An ugly gutted shell was left standing and the county now had to face the expense of demolition. The courthouse pigeons attempted to return to their roosts in the brick eaves. After the ruins cooled sufficiently, the pigeons did return - until the walls were demolished. 50,000 to 60,000 bricks were cleaned and sold. The old bell now sits atop the former cornerstone in front of the new building. A short length of surviving banister is housed nearby at the old Austin County jail museum and a few scorched pieces of furniture survived. The couthouse in oil. 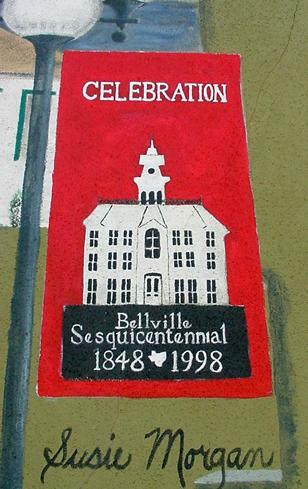 A painting by artist Frank C. Dill hangs in the Bellville Public Library. 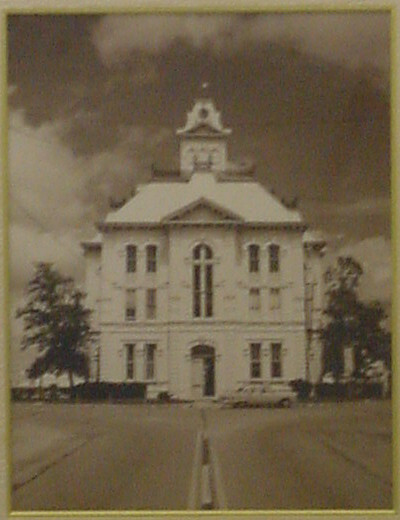 A framed photo of the Old Courthouse hangs in the New Courthouse. 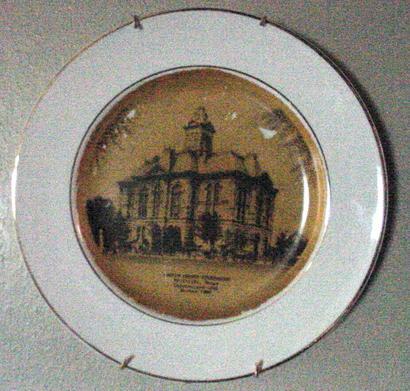 and even on a plate that hangs in the jail museum. 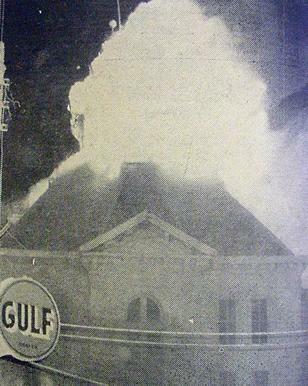 The complete story of the courthouse fire is available at the Bellville Library. 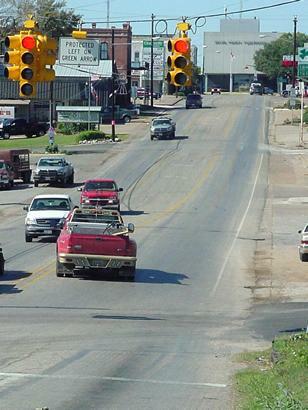 View of Main Street from the railroad tracks. Courthouse in distance.